If you were casually walking past this grave marker, you would be sure that it was a tree trunk creatively used as a grave marker, but it is not. It is made of stone. Notice also how a stone potted plant rests permanently at the base of the marker. This grave marker is found in the Greenwood Cemetery in Owen Sound, Ontario. This photograph was taken during a tour of the cemetery in September 2007. Checking Mary's death registration, I found the following information. She is listed as a widow. Her son James is the informant and he is living in Singhampton. Her date of birth is given as Feb 17th 1844. Her parents are shown as William Raeburn and Margaret McCormick both born in Ireland. Mary is listed as living in Ontario all her life. Discrepancies in the date of birth are understandable but why is she called a widow? 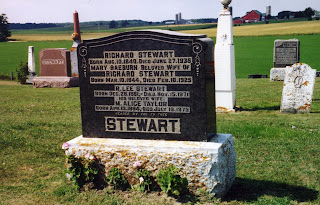 On the marriage registration of R. Lee Stewart and M. Alice Taylor, we get their full names -- Richard Leopold Stewart and Martha Alice Taylor. They were married 22 March 1911 in Simcoe County. Mary Stewart Ontario death registration #014577 (13 February 1925)digital image, Ancestry.ca (http://www.ancestry.ca : accessed 14 February 2009); citing Archives of Ontario microfilm Ms 935 reel 324, Toronto.